If I ranked all the books I reviewed this year, this one might very well snag the number one spot at the top of that list. I loved it. No, I’m a little in love with it. The publisher sent me this one unsolicited along with others I had requested and, in all honesty, it doesn’t sound like much. The blurb on the back doesn’t make it sound intriguing and if I summarize the premise without any gushing, I probably won’t make it sound intriguing. It’s a story about three misfit friends navigating high school. Well, aren’t they all? But wait: you really need to meet these ones. Second there’s Travis, easily my favorite character as I’m a sucker for anyone who lets their dork flag fly out in the open without shame. Travis is obsessed with a fantasy series and even carries a staff with him everywhere. He knows doing so makes him as easy target for ridicule but the staff is meaningful to him and above all else Travis is true to himself. However, his adorable geekiness is shadowed by his abusive father. Not even his closest friends know, and as Travis suffers along with his mother he wishes he could be like the brave, strong heroes of his favorite series. Last but not least there’s Lydia, whose strong will and bossy demeanor can be both admirable and overpowering. When people tease their trio at school, she returns with whip-speed, smart, withering comebacks. Lydia wants more for herself than this small town life. She maintains a successful fashion blog and has plans for New York next year. However, her critical remarks about their hometown and everyone in it cause tension with her friends, both fearful she can’t wait to leave them in the dust, too. I found this book absolutely stunning. The more that I read, not to mention the more that I write myself including studying and breaking down a book into its pieces, the more critical a reader I become. Even when I love a book I almost always have some nitpicky criticisms. 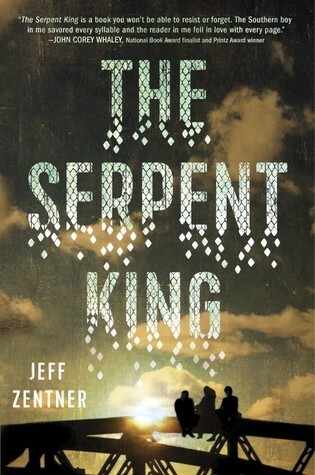 THE SERPENT KING I simply adored. Read it.